Posted Thursdays: Aug. 27, Sep. 3, 10, 17, 24, Oct. 1, 8, 15, 22, 29, Nov. 5....or weekly until the first monarchs arrive in Mexico! News Flash: Monarchs Reach Winter Home in Mexico! This news just in: The monarchs arrived in large numbers yesterday at Mexico's winter sanctuary region. The news was announced by biologist Eduardo Rendon. "Today, all of the roads that lead to the Monarch Reserve are full of butterflies." We'll be back next week with our final migration update of the season. Meanwhile, picture millions of monarchs flying across the finish line as they complete their long migration. Congratulations, monarchs! For the past week, monarchs have been crossing northern Mexico in higher numbers than have been seen for years. Across which Mexican states do the monarchs travel in Mexico? Explore a map of the probable migration pathway and see why Dr. Calvert says it's "delightfully confusing." This week's slideshow features the holiday people in Mexico celebrate at this time of year, as the monarchs arrive. Photo: Rocio Trevino, age 10. Monarchs were moving down the Atlantic Coast this week in the largest numbers of the season. A second wave moved has out of the Great Lakes and down the Ohio River Valley. All are headed toward Texas then into Mexico. Our reporter at the overwintering sites says everybody's watching and waiting! Meanwhile, this fall's most frigid tempeartures are spreading across the continent. How does temperature affect fall migration? Find out! The monarchs cruised into Kansas this week. Samual counted 1,018 monarchs in 1 hour and 20 minutes, all headed south. "It was totally amazing!!!" This week, learn how standard units of measurement help us make sense of migration data. Read this week's observation reports from citizen scientists and see how to count monarchs per hour (or monarchs per minute). When you report your own monarch observations, don't forget to tell us how long you were watching! Look at the animated migration map and you will plainly see, the monarchs are moving toward their winter home in Mexico. This week's southernmost roost was reported in Kansas, only 1,350 miles from the finish line. 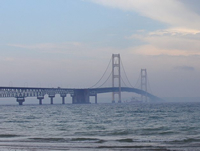 Also this week, what can you learn from a single sighting on a bridge over Lake Michigan? What does the map of Great Lakes sightings reveal? Notice how observations lead to questions. This is one of the values of citizen science. Spectacular roosts were reported in Nebraska this week. With tens of thousands of butterflies, they were the largest yet of the season. Both roosts were found beside blooming alfalfa fields, a welcome source of nectar for migrating monarchs who are traveling through a sea of cropland. Early arrivals continue to be reported from the south. Also being sighted are Queen butterflies, a Monarch relative and look-alike. Can you distinguish a Monarch butterfly from a Queen?